Nosemosis, or Nosema disease, is caused by two species of microsporidian parasites (a type of spore forming fungus) called Nosema apis and Nosema ceranae. N. apis is thought to have originated on European honey bees, while N. ceranae is thought to have evolved as a pest of Asian honey bees (Apis cerana) and has only started to affect the European honey bees relatively recently. N. ceranae appears to be more damaging than N. apis, affecting more cells in the bees mid-gut and killing infected bees faster than N. apis. Infection of adult bees at a young age can cause the bee to have difficulty digesting food for the rest of its life. These bees usually do not produce brood food/royal jelly secretions from the hypopharyngeal glands and often skip the brood rearing stage of their life, becoming forager bees at a young age. The infected bee often has a shortened adult lifespan. When queen bees become infected they also have reduced lifespans and cease to lay eggs. These impacts cause reduced colony health, population and performance, which can ultimately result in the colony dying. Infection begins when a bee ingests Nosema spores, which then germinate inside the mid-gut of the bee. The fungus enters the cells of the mid-gut and begins to absorb nutrients. This causes the cell to become damaged and the bee to be more susceptible to secondary infections. The fungus grows and multiplies infesting more of the mid-gut cells and produces spores. Several million spores can be produced in a single worker. The spores either germinate within the bee’s mid-gut, infecting new cells, or pass through the bee’s digestive system. 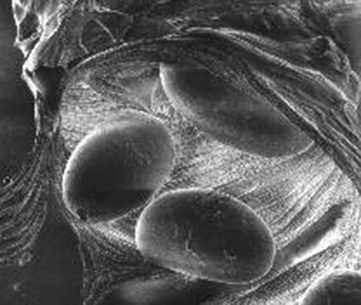 Faecal material containing Nosema spores can contaminate food and water sources, where they can then be ingested by other bees. Spores can also be spread to non-infected bees when they clean contaminated combs, or rob contaminated hives and ingest spores in the process. Both Nosema species affect the honey bee’s digestive system causing a range of symptoms, which are more apparent when nutrition is poor and weather conditions are cold and wet. However, there are no truly diagnostic symptoms of Nosemosis, rather a number of symptoms that are associated with the disease. However, these general colony symptoms could easily be confused with other pests or pathogens, or other factors such as a lack of pollen or nectar. Laboratory examination of adult bees is the only accurate way to diagnose Nosema. A common symptom of Nosema apis infection is dysentery (brown diarrhoea on combs and the outside of the hive). Dysentery is not actually caused by the fungus, although N. apis infections make the infected bee more susceptible to other secondary infections, which subsequently cause the dysentery. 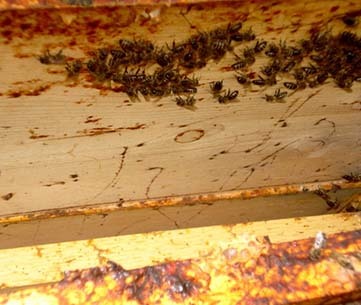 Infection by N. apis is also associated with the presence of honey bees crawling around the hive entrance, sometimes with wings held at odd angles. Some bees will have swollen and greasy looking abdomens and in severe cases may appear to be trembling. Workers that are infected at a young age become unable to produce brood food and become foragers at a young age. This together with a reduced egg laying ability and shorted lifespan of infected queens causes a reduction in brood production. This causes reduced colony strength and may result in reduced honey production and heavy winter losses. N. apis infections are usually most apparent in autumn and early spring. This is because the bees are often unable to make cleansing flights at these times of the year as the temperature is regularly insufficient for flight. This results in dysentery in and around the hive, which allows the spores to build up within the hive and have a greater impact on the colony. As temperatures warm again the bees can make regular cleansing flights causing the infection levels within the colony to drop and the disease to become undetectable. Symptoms will likely return when conditions again favour the disease. Good management practices (such as keeping hives in a warm and sunny position over the autumn, winter and spring periods to allow regular cleansing flights) can reduce the risk of the disease building up to damaging levels over the cooler part of the year. Unlike N. apis, N. ceranae is present at similar levels all year round and population losses can occur at any time of the year. Infections typically result in a slow drop in the adult population over summer and heavy winter losses. Sometimes dead bees will be seen around the hive, but this is not always the case. Infection by N. ceranae has a similar overall effect on the colony as N. apis. However, the dysentery and crawling bee behaviour that is associated with N. apis, has not been observed with N. ceranae. Unfortunately, there are no reliable or field diagnostic symptoms associated with Nosemosis and even some of the general symptoms could easily be confused with other factors affecting honey bee colonies, such as a lack of pollen or nectar, inappropriate pesticide use or various other pests or diseases. Despite this, beekeepers should become familiar with some of the general symptoms listed below and always be aware that if your hives are in generally good health, but you are noticing some of these general symptoms, then your hives may be affected by Nosema disease. worker bees crawling around the hive with swollen or greasy looking abdomens (only with N. apis). If these symptoms are observed the cause could be Nosema. Microscopic examination is the only accurate way to diagnose the disease. Contact your local department of agriculture if you would like more information about how to take a sample of bees to test for Nosema disease. Because Nosema is invisible to the naked eye and the fact that it causes very general symptoms, it is commonly referred to as the ‘silent killer’ of bees. For this reason and as a precautionary biosecurity measure, beekeepers are encouraged to send samples of bees away every spring to monitor the Nosema levels in your loads of hives. This will ensure that you are on the front foot in combatting this disease and aware of any problems you may face in the future with this disease. General symptoms associated with Nosema disease such as dysentery, reduced brood production, reduced honey production, or population declines could be confused with other factors affecting honey bee colonies, such as lack of pollen or nectar, inappropriate pesticide use or various other pests or diseases. For this reason, there are no reliable and specific field diagnostic symptoms associated with Nosemosis. Laboratory examination of adult bees is the only accurate way to diagnose Nosema. It is also difficult to differentiate between the two Nosema species, although the presence of dysentery and crawling bees is more typical of Nosema apis infection rather than Nosema ceranae. In Australia it has been observed that N. ceranae levels are generally higher in warmer climates, whereas N. apis is generally more present in cooler climates. Nosema produces spores inside the mid-gut on infected bees, which allows the fungus to spread. Spores can enter a hive either naturally or with the assistance of humans. The spores can naturally enter hives. Hives that are heavily infected become weakened or, in severe cases, can die out completely. This makes them a target for robbing bees. Robbing bees ingest spores and then take the infection back to their colony. The natural drifting behaviour of bees can also spread the disease between hives. If water and food sources become contaminated with faeces containing Nosema spores then any bees using that food or water source can also become infected and bring the disease back to their colony. 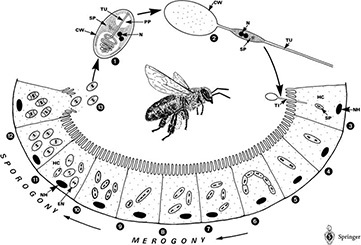 Beekeepers can accidentally spread the spores of Nosema by moving combs from an infected colony to a non-infected colony. The spores can also be spread on tools between hives and apiaries. Maintaining good hygiene practices and checking the health of hives regularly can reduce the risk of accidentally spreading the disease between hives. 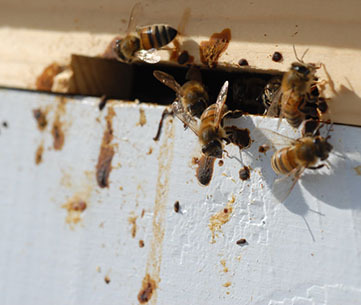 Once in a colony the disease can spread rapidly between bees, especially during cooler conditions when bees cannot make cleansing flights and are forced to defecate within the hive, causing the disease to build up in the hive. Nosema apis is spread when spores that have passed through the digestive system of an infected bee are ingested by a healthy adult bee. The spores can contaminate water sources, food sources or be picked up by bees cleaning waste material, specifically faeces, from within and around the entrance of the hive. Nosema ceranae is spread in the same way as N. apis. There is also some evidence that suggests that N. ceranae can also be spread via the transfer of food between bees, but this is yet to be conclusively proven. Both species of Nosema are found in all honey bee producing continents. In Australia, N. apis has been reported in all states and territories of Australia. N. ceranae has also been reported from all states and territories of Australia, except for WA. Nosema apis is a reportable pest in Queensland, New South Wales and Victoria. Nosema ceranae is a reportable pest in Western Australia and New South Wales. If these pests are identified in these states they must be reported. Contact your state or territory department of agriculture for more information. The most effective control of the disease relies on maintaining strong hives and taking precautions to reduce the build-up of the disease. The best way to manage Nosema is to maintain a strong, healthy hive. Good management practices such as ensuring that appropriate nutrition is available to bees, using young queen bees, and comb rotation every 3-4 years will keep colonies strong and remove possible causes of stress, which can make the colony more susceptible to the disease. 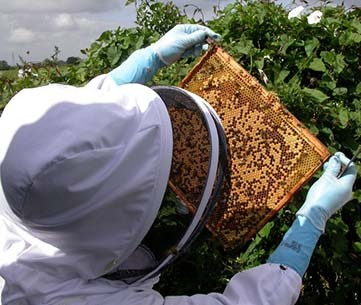 It is also good practice to try and avoid moving hives, or inspecting hives during winter, as inspections and movements at this time can increase the stress levels within the colony. When getting hives ready for winter, always ensure that there are not excess boxes on the hive, as well as ensure that there is enough good quality honey and pollen for the colony. If there is not, consider feeding a protein rich pollen supplement and sugar feeding. Although there are no reliable or specific field diagnostic symptoms associated with Nosemosis, beekeepers should also become familiar with some of the general symptoms that may be caused by Nosema infection. If you start to notice symptoms such as dysentery, reduced brood production, reduced honey production or population declines and there are no obvious reasons why this may be occurring, you should send a sample of bees to your local department of agriculture for testing. As a precautionary measure, it may also be worth sending a few samples of bees away every spring to monitor the Nosema levels in your loads of hives to make sure you are on the front foot in combatting this disease. Nosema is more apparent during cooler times of the year when bees are forced to defecate in the hive rather than take cleansing flights. Beekeepers should place their hives in a warm and sunny position over the autumn, winter and spring periods. This will allow the colony to regularly forage and defecate outside of the hive. This prevents the accumulation of Nosema spores in faeces deposited in the hive. 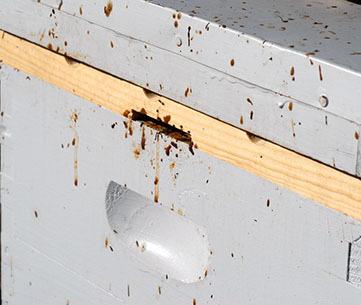 Beekeepers should also take precautions to ensure that any hive equipment that is possibly infected with Nosema spores is decontaminated before use, as this will reduce the spread of the pathogen between hives. For this reason, look at establishing a barrier management system for your apiary to avoid the possible spread of this disease throughout other apiaries. These videos have been produced to help provide information about the life cycle and biology, identification and possible management options for Nosema. Please be aware that some of these videos have been produced overseas, and treatment recommendations or conditions experienced may differ from those in Australia. Nosema best management practices, Project Apis m.